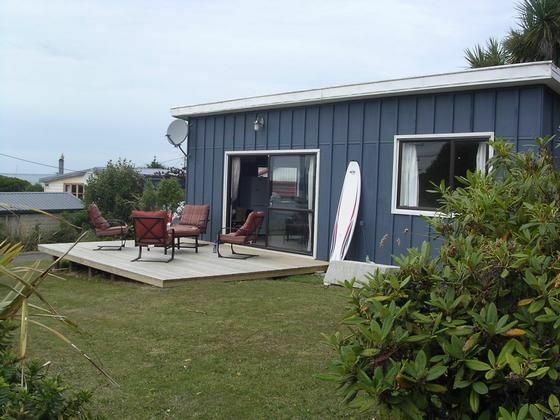 Modern,open planned beach house with a large, sunny and sheltered north facing deck. Includes a heat pump, rinnai gas hot water and modern appliances and fixtures. The beach house has a very spacious modern bathroom as well as two good sized bedrooms, with each of the beds (1 x queen and 2 x singles) having new mattresses. Sea views from the kitchen and deck. Right beside a children’s playground and backing onto a reserve. Short walk to the beach, ( patrolled in summer ) The Point Cafe and Bar and shop. Close to nature walk . Tennis court at the top of the street. Lots of native bird song !!! Gateway to the Catlins, including the Nugget Point lighthouse and natural wonders including yellow-eyed penguins at Roaring Bay, sea lions at Surat Bay and the famous Purakanui Falls. We really enjoyed our stay. Very chilled out and we had everything we needed. Great spot! Had a really nice three night stay. My Husband and I spent a super weekend in this very comfortable Holiday Home. It is a sunny Beach House.- Walking distance to a Bathing Beach and Beach Walks.